Oxy Plus Formula wsp is a scientifically balanced and concentrated multivitamin powder enforced with the broad-spectrum antibiotic oxytetracycline. Oxytetracycline is active against Actinomyces, Rickettsia and Chlamydia and is therefore recommended for the treatment of Mortellaro, Moraxella bovis conjunctivitis in calves and Pasteurella multocida and Mycoplasma infections in poultry. The antibiotic effect is bacteriostatic. 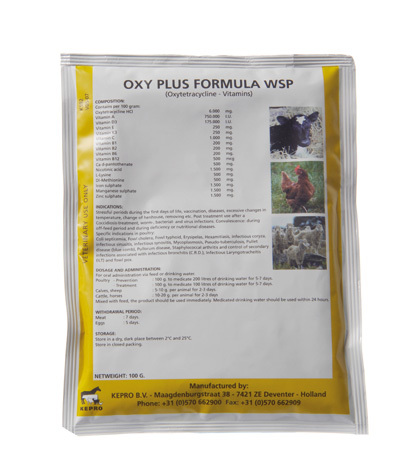 Oxy Plus Formula wsp is indicated for stressful periods during the first days of life, vaccination, diseases, excessive changes in temperature, transfer to a new hen house, removing, during extreme humid and hot weather conditions, etc. Post-treatment use after a Coccidiosis treatment, worm-, bacterial- and virus infections. Convalescence: during off-feed period and during deficiency or nutritional diseases. Specific indications in poultry: Coli septicemia, Fowl cholera, Fowl typhoid, Erysipelas, Hexamitiasis, infectious Coryza, infectious sinusitis, infectious synovitis, Mycoplasmosis (CRD), Pullorum disease, Staphylococcal arthritis and control of secondary infections associated with infectious Bronchitis, infectious Laryngo-Tracheitis (ILT) and Fowl pox. 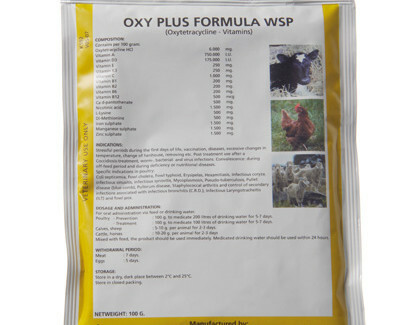 Oxy Plus Formula wsp is also indicated for the treatment of weakness of the animal, retarded or disturbed growth, decreased fertility, skin problems or any other predominately attributed vitamin deficiency symptoms together with suppressed infections. Poultry : 100 g per 100 litres of drinking water during 5 – 7 days. Calves, sheep : 5 – 10 g per animal during 2 – 3 days. Horses : 10 – 20 g per animal during 2 – 3 days. Piglets, up to 20 kg b.w. : 1 – 2.5 g per animal during 3 – 5 days. Pigs, from 20 kg b.w. : 2.5 – 7.5 g per animal during 3 – 5 days.